Light-duty slurry pump is a centrifugal pump with cantilever impeller. It is chiefly designed to meet the demand of non-ferrous and black mine mineral processing system. Solid and durable, centrifugal dredge pump is always the first choice for transporting tail mine slurry, ashes and other slurries in dressing plant, power station, coal washery and metallurgical plant. 1. Light-duty slurry pump employs unique anti-corrosive design and the wetted parts have a long service life. 2. Multistage tandem technology can be used to meet long distance transportation. 3. Centrifugal dredge pump has features of high performance cost ratio, easy maintenance, wide performances and high efficiency. 4. Various types of wetted parts are provided to meet all kinds of working conditions. 5. Rubber front plate of light-duty slurry pump can be used for 205 days. And the service time of rubber impeller is 120 days, much longer than other impellers. 6. Jiangxi Naipu Corporation gains technological supports form Beijing General Research Institute of Mining and Metallurgy, Eastern China University of Science and Technology, etc. 7. Light-duty slurry pump makes use of EDEM discrete finite element analysis software in the design. 8. The flow cross section is enlarged and components structures are optimized. 9. Centrifugal dredge pump adopts a lot of wear resistant designs to reduce abrasion. 10. High wear resisting rubber is employed which features high resilience, chemical stability, anti-cavitation, light weight and easier replacement. Besides, this kind of rubber can absorb noise and vibration. 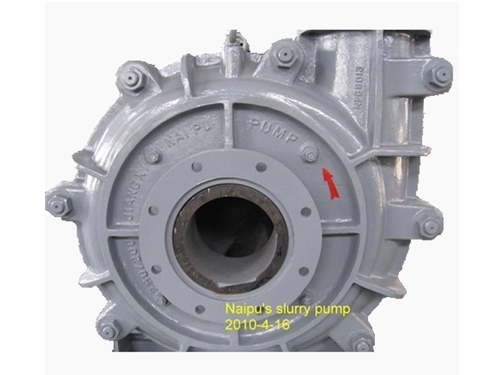 Thus, light-duty slurry pump is much more resistant to erosion. 11. Strict quality tests ensure the quality of the pump. 12. Naipu also offer centrifugal dredge pump selecting service. 1. Please follow the security measure to install, operate and maintain light-duty slurry pump. 2. The installation, operation and maintenance of auxiliary devices should also comply with this security measure and other regulations. 1. Check and repair shaft seal. 2. Make adjustment of impeller. 3. Make replacements of quick-wear parts to avoid the damage of light-duty slurry pump. Please choose appropriate model of light-duty slurry pump on the basis of minerals and slurry. 1. Light-duty slurry pump should be packaged in iron cases. 2. Shipping ways are by sea and land transportation. 2. Centrifugal dredge pump will be delivered within 30 to 60 days after receiving down payment. Field installation and maintenance services will not be provided unless the purchase orders of light-duty slurry pumps reach a certain amount.